The Annual Fall Work Day in Little Zilker Park is this Saturday morning, November 3rd, from 9am to noon. Little Zilker Park is located next to Zilker Elementary School along Bluebonnet Lane (see below). If you have questions – email: LittleZilker@gmail.com. Remember to wear closed toe shoes. Bring shovels, rakes and wheelbarrows, if you have them. If not, we will have some available for use. More people means less work for all and a great improvement for the park. Thank you and look forward to seeing you in the park. Let me begin by saying I saw a Red Bud tree blooming yesterday, February 7th, on Kerr St. I’ll let you do the roaming to find it. Red bud trees will be mentioned later in this post … but now to my topic! Combining two of my favorite things in the world: reading and gardening – is the Leaf for a Leaf program sponsored by the Austin Public Library, TreeFoks, Austin Parks and Recreation Urban Forestry Program, and Austin Energy. 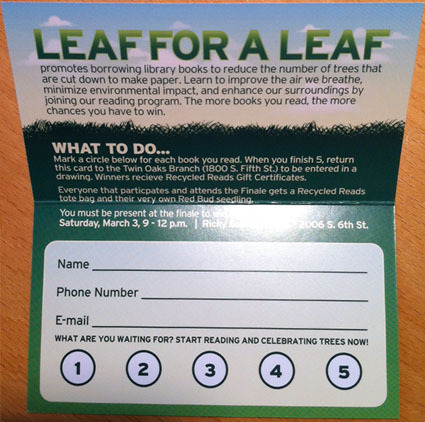 Attention tree lovers of all ages, the Leaf for a Leaf program promotes borrowing library books to reduce the number of trees that are cut down to make paper. Learn to improve the air we breathe, minimize environmental impact, and enhance your surroundings. The program celebrates trees in the late fall through the early winter because it is the best time to plant them in Central Texas. This year Leaf for a Leaf takes place from October 29 through March 3. Make sure to participate in our Leaf for a Leaf reading contest. Turn in a card at the Twin Oaks Branch, 1800 South Fifth Street, for every five books you read. The more you read, the better chance you have of winning a big prize. So what are you waiting for? Start reading a leaf for a leaf now! And now let’s turn to gardening. The finale event of Leaf for a Leaf is an event at Ricky Guerrero Park (click for map), which is located just south of the Twin Oaks Library. See the details below. At this event, not only can you help mulch trees at the park, it looks like you can also receive a free book bag, a red bud sapling (one of my favorite trees – I have planted 3 of them in the last year at my own house, though mine are not blooming yet), and mulch. Tree Celebration Finale @ Ricky Guerrero Park, 2006 S. Sixth St.
Bring the whole family to show some love for the trees at Ricky Guerrero Park. Join the Library and Parks Departments to mulch the park’s trees. There will be snacks, hands-on book and tree themed crafts for kids and adults. Everyone who attends will walk away with a free book bag, sapling and mulch. Austin Parks and Recreation’s Urban Forestry experts will be on hand to teach you how to care for your new tree-to-be. Additionally, turn in your Leaf for a Leaf frequent reader cards to be entered into a drawing for exciting prizes! You must be present to win. This is your chance to also reap the benefits of all the reading you are doing. Turn in your reading logs, and you’ll be entered into the drawing. See you there on March 3rd. I chose to plant a chinquapin oak (Quercus muehlenbergii), native to the U.S., in my front yard. Mine looks nothing like the picture below, since I just planted it in October, 2010. But my front yard had no trees, so we had to get something going. It probably won’t provide a lot of shade for 5-10 years, but you have to start the trees off at some point. This tree is deciduous and can grow up to 72 feet tall. Its leaves grow wider at the end. The acorns are about 2″ in size. It can grow in sun or part shade and can tolerate dry, rocky soils. From what I read in Garrett’s book, it loves rocky soils like in the hill country. The rockier, the better. The acorns are edible after a long process of boiling to remove the bitterness. I read from one book where they used them to make pancakes, but the task sounds arduous. The chinquapin oak is a larval host for the Gray Hairstreak butterfly. This means that the Gray Hairstreak butterfly will lay eggs on the leaves of the chinquapin oak. When the eggs hatch into larvae, the larvae (or caterpillar) eats the leaves of the oak until they move onto the pupae stage of growth into butterflies. This is still a great time to plant a tree or trees. It gives the trees some time to get established before the heat of summer begins. You should water your tree about 1″ a week while getting established. The chinquapin oak grows relatively fast and has few pests. Plus, it is kind of fun to say chinquapin! Remember, this becomes a very large tree, so don’t plant it under the electrical lines! Several City of Austin agencies collaborated on a series of native and xeric landscape designs. They have just released a new one, the creekside design (PDF download). These designs are listed in my Garden Resources page on this website, but since they released a new design, I felt it was worth advertising them directly. I love to look at these because they provide ideas for plants that are specific to the specific land-type, such as the creekside. The creekside assembles plants and trees for a sun/part-shade land area that has some slope down to a creekbed. They suggest some native oaks like the chinquapin and live oak. Shrubs like Eve’s Necklace and Chili Penquin (edible, too) and some ornamental grasses like Inland Sea Oats and Eastern Gama Grass. If you live in Austin (as most of you do if you are reading this), you can also order printed landscape design booklets at this website. Don’t be overwhelmed by these – look at them and find what you like and just emulate those parts in your landscape. Do a little bit at a time.